In recent years, the Crayford style of ball-bearing guided focuser has become popular due to its smooth motions, absence of pinion backlash, and rigid drawtube support. Baader's new Diamond Steeltrack Premium Focusers incorporate a number of innovative features that further enhance the smoothness and robustness of the Crayford focuser. Baader's innovative diamond-geared drive system delivers the smooth totally backlash-free action of a friction drive with the positive non-slip high load capacity of a rack and pinion. Additional improvements in the bearing-guide system help to take the Baader Diamond Steeltracks (BDS) far enough beyond all other crayford-type focusers that some have called them 'Baaderford'. 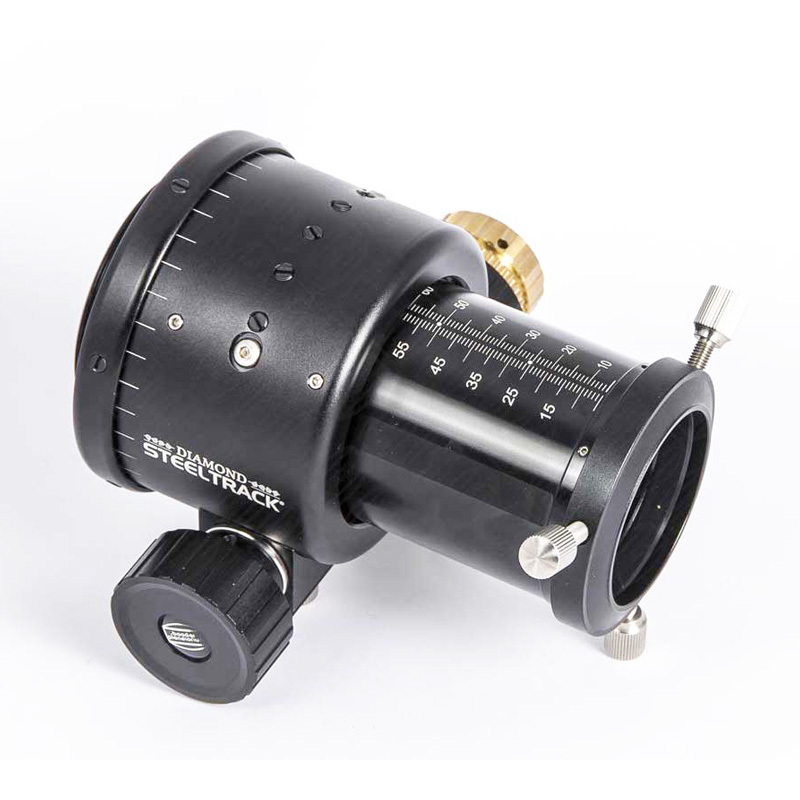 Baader Planetarium's 2" Refractor Diamond Steeltrack Focuser gives refractors a full 3" (76mm) of velvety smooth focusing travel. Easily adaptable to popular refractors. 72mm dovetail receiver permits 360-degree rotation of focuser with single-screw locking. Optional RT adapterset permits easy attachment to Celestron/Skywatcher/Zeiss refractors, and is adaptable to other refractors. Optional adapters available to fit a variety of other refractors. True diamonds form a micro-geared high precision drive system never accomplished before. In comparison to conventional crayford or rack & pinion drives, this micro-geared movement has zero backlash, zero cogging, and zero flexure. Diamond Steeltrack 2" focusers lift a payload of 6kg (13 lbs) straight up, without slipping, without excessive bearing preload (bearing preload can be increased further if necessary). Bearing system utilizes unbreakable instrument grade roller-bearings instead of simpler ball bearings - handles higher loads with greater rigidity and accuracy. No Teflon-pads anywhere. 1:11 stainless steel fine-focus mechanism, ready for attachment of the optional Steeldrive temperature-compensating motor drive system. The brass reduction gear is prepared to accept the timing belt of the Steeldrive motor-drive unit. The outer case of all Diamond Steeltracks have a dovetail cut into the driving-axis housing to accommodate the motor block of the Steeldrive unit. Detachable drive block assembly is reversible for right hand or left hand fine-focus operation and for attaching the Steeldrive motorblock onto Diamond-NT-Steeltracks for newtonian telescopes. Shortest possible mechanical design achieves optimum balance between focuser height (backfocus) and rigidity requirements. Zero shift locking knob to precisely stop any movement without affecting optical axis adjustment. Each bearing individually adjustable for precise alignment of mechanical vs. optical axis. Ultra-hard subzero coated bearing races – precision milled and much harder than anodizing or stainless steel. Oversized 55mm inner clear diameter, to prevent vignetting, with anti-reflection knife-edge baffles. S58 Dovetail ring-clamp built into focusing tube for accepting optional T-2 / M48 / M68 and other S58 direct-thread adapters to enable direct thread connection of accessories and cameras without 2" clamp. 2" eyepiece clamp with hardened bronze clamp ring (length of clamp: 12.5mm (0.5") included as standard. Optionally available: 2" Baader Clicklock-clamp with integrated S58 dovetail (added length: 16mm (5/8")).